Here's the GPS track for Ophir Pass—almost a straight line! I haven’t been over Ophir Pass in many years. The last time, about 10 years ago, was on a street bike, my Yamaha Seca II 600 cc sport-touring bike. I was with three other riders, we were exploring the area, and were told (this is the truth!) that a Corvette could make it over! Well, not so. The four of us came away with a rather harrowing experience of trying this road with totally inappropriate equipment! But on July 24th, in the rain, I gave it a go on my Yamaha XT-250 dirt bike. Piece of cake! I would rate the road as beginner++ because of some steep spots, plus the trip down the rockfall requires a fair amount of control. Here a 4WD vehicle has climbed the rockfall and is heading east. To get to the east end, travel south from Red Mountain Pass, down the shelf road and past the few remaining buildings at Chattanooga, the watch signs on the right hand side. The Ophir Pass road is clearly marked. You’ll travel upward gradually at first, then at increasing rates, on well-kept road without much scree. You come out on the pass itself in a narrow vee between the mountains—don’t blink or you’ll miss the sign marking the pass. From there, you’ll travel on road that’s rather bumpier, but still in good shape. The drama starts at the sharp, descending right hand turn. That’s where I was standing when I took the picture above. Here's what you'll see as you start down the rockfall. Remember that vehicles coming up have the right of way. Notice how tiny the vehicles are compared to the mountainside! The road down the rockfall is dramatic, to say the least. I strongly suggest concentrating entirely on the road. If you feel the need to look down the endless rockfall, stop your bike completely! I left the bike in first gear and rode the front brake a little to keep the speed under control. The road is bumpy, but in much better shape than I remember from ten years ago, although perhaps being on a street bike back then made it seem bumpier than it really was. Note that those coming uphill have the right of way. On a motorcycle going down, that isn’t too much of a problem, because you can find many places on the way down to pull up against the mountain and wait for the uphill vehicle. Once across the rockfall, the road heads almost due west. The speed limit is slow, sometimes unrealistically so. The town of Ophir is rather spread out, so show respect to the locals by not speeding in front of their houses where the kids play. There were a couple signs warning of speed bumps, but no actual speed bumps. 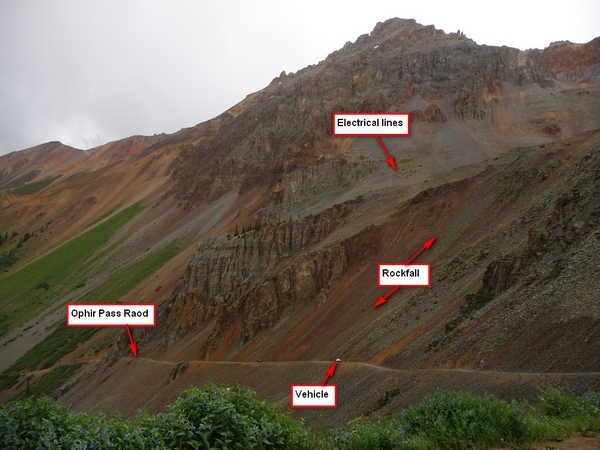 Eventually you’ll come out on Colorado Highway 145 and can turn right (north) to Telluride. What was cool for me was the weather, which was drippy and sometimes foggy. Yes, I was pretty thoroughly wet and so was the road, but there was no mud. I thought I might slip on the wet rock, but that turned out not to be a problem. 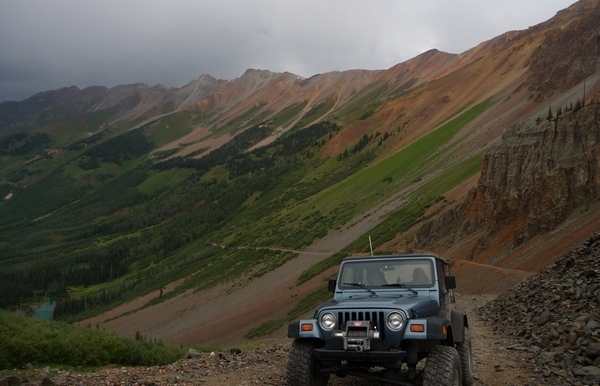 Ophir Pass is not the hardest pass hereabouts, but is certainly one of the most dramatic. This entry was posted in GPS Tracks, Motorcycling, San Juan County, San Miguel County. Bookmark the permalink.